Tondli or Tindora also known as Ivy Gourd in English is a tropical plant that is a native in India and other Asian countries. The leaves, roots & fruit of Tindora are used to make medicine. This Tondli vegetable comes with tons of health benefits like relief from digestive problems, diabetes, protection from cancer as well as in treating a few infections. 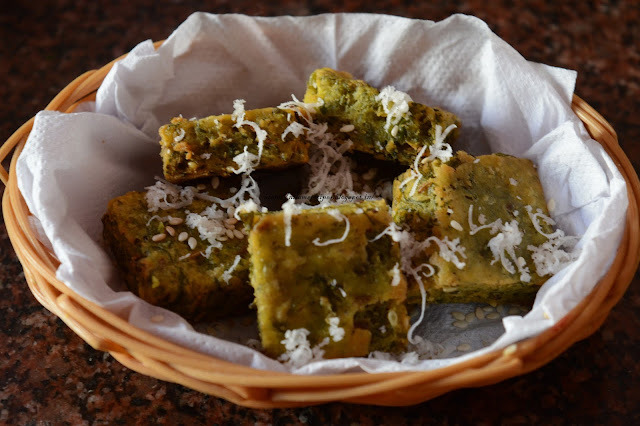 Bharli Tondli Recipe is a Maharashtrian shortcut to benefit for all these healthy properties. In this recipe, tondli is stuffed with rich masala made of roasted coconut, onions and spices, fried with potatoes and later cooked in the same masala with seasoning. This Bharli Tondli Recipe has a great texture as well as a great tangy taste with the mixture of tamarind, jaggery and chilli powder. This Bharwan Tindora Curry tastes best when served with chapati or bhakri. It can also make a great side dish along with plain dal and rice. For similar stuffed vegetable recipes, check: Bharli Vangi Recipe, Bharli Bhendi Recipe, Stuffed Karela Recipe, Stuffed Eggplant Recipe. Dry roast grated fresh coconut. Add 1 tsp of oil and fry sliced onion. In a mixer grinder add fried onion, roasted fresh coconut, red chilly powder, turmeric powder, garam masala, tamarind, jaggery, coriander powder, ginger garlic paste or ginger garlic and salt. Make fine paste and keep aside. Wash Tondali, trim and slit them into 4 without breaking them. Stuff masala in all Tondali. Heat oil in kadai and add mustard seeds, cumin seeds, asafoetida. Once they start cracking, add stuffed Tondali, sliced potatoes and fry them till they turn light brown in colour. Add water in remaining masala and bring it to boil. Add this water to the Tondali and cook covered for 10 minutes. Serve with chapati or bhakri. 1) Dry roast grated fresh coconut. Add 1 tsp of oil and fry sliced onion. 2) In a mixer grinder add fried onion, roasted fresh coconut, red chilly powder, turmeric powder, garam masala, tamarind, jaggery, coriander and salt. 3) Make fine paste and keep aside. 1) Wash Tondali, trim and slit them into 4 without breaking them. 2) Stuff masala in all Tondali. 3) Heat oil in kadai and add mustard seeds, cumin seeds, asafoetida. Once they start cracking, add stuffed Tondali, sliced potatoes and fry them till they turn light brown in colour. 4) Add water in remaining masala and bring it to boil. 5) Add this water to the Tondali and cook covered for 10 minutes. Remove from heat. 6) Garnish with chopped coriander leaves. Serve with chapati or bhakri.